Considering customers' usability, consumables are standardized. 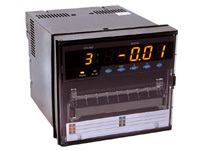 • True Hybrid Design - Units offer fully programmable features including: input types, chart speed, data recording session and intervals, scaling, alarm points, etc. • True Multi-Input - Units feature true multi-input capabilities: 13 thermocouple types, 1 RTD type, 1 current inputs, and 7 voltage inputs. • Computer Communications - All units feature RS-232C communication interface. • Large/Full Function LED Display- All units feature full function digital display of channel number, PV value, and recording and alarm status, etc. Bright red 18mm display. • 1, 2, And 6 Point Versions Available - Units are available in either 1 or 2 channel, or 6 point recording versions. • Designed For Harsh Environments - Units rated to IP65, and constructed of flame resistant resin. • Compact Design - Unit measures only 150 mm in depth and weighs less than 1.5kg. • Safety Approvals - UL, CSA and CE Safety Approvals. • Warranty - All units manufactured to strict ISO standards and offer full 2 year manufacturers warranty. • Low Cost - Most advanced price/performance package available.